We spent the afternoon learning how to control our canoes around the sharp corners and how to take advantage of the swift current. Because of the twisting of the river, around each bend were large, white sandbars. As the afternoon wore on, we found a large sandbar, big enough for all of us to camp on. 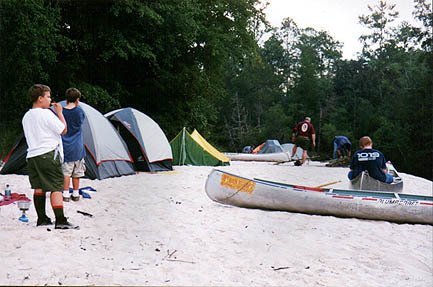 We unloaded our gear and began to prepare camp for the night. After dinning on ramen and kool-aid, we cooled off by swiming and fishing in the dark cool water off the river. A few hours after the sun had gone down we heard the drone of a large aircraft flying nearby. Moments later, a C-130 transport plane flew over our camp. We went to sleep that night listening to the sounds of C-130's, helicopters, and practice munitions from the nearby Air Force base. 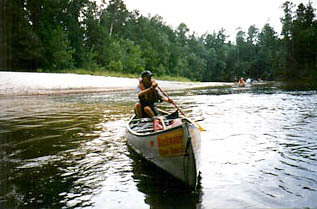 We all slept soundly that night, after a tough, but fun afternoon of paddling one of Florida's best rivers.